Your Local Living Moment: Overnight at Berber Desert Camp, Sahara Bedouin Camp. Visit to Aït Ben Haddou Kasbah. Orientation walk in Essaouira. All transport between destinations and to/from included activities. Hotels (6 nts), tented desert camp (1 nt, multi-share). In the morning, don't miss the colourful and lively spectacle of the return of the boats to the port, with their baskets full of fish. Afterwards, head up to the ramparts on the old city wall for a great view over the city and out to sea. Browse the shops and art galleries or take a stroll along the long, sandy beach. This is the perfect place to unwind and relax with a cold beer or shisha pipe (waterpipe). The active might choose to take a surfing or windsurfing lesson, hire a fishing rod or just take a long walk on the beach. In the evening, head to one of the local barbecue fish cafes where you can pick out the catch of the day and have it cooked to perfection for an amazing seafood dinner. Essaouira is also famous for its music scene and offers a great chance to check out a live performance. Like anywhere in the world, major cities have areas safer than others, use common sense, be aware of your surroundings and mind your personal belongings. It is important to note that as it is not a legal requirement in buses in Morocco, your vehicle may not be equipped with seat belts. On this trip you can expect to stay in local hotels or pensions (with the exception of the start and finish hotels, which are often larger city hotels), which will vary a little in standard and facilities: some may not have elevators, air-conditioning or English-speaking staff, but most importantly all are locally-run, with some traditional character, and in excellent central locations to give you maximum time for exploring the sights. Where a town has both an ancient medina and a "ville nouvelle" we generally stay in the ville nouvelle, both because the standard of hotels is higher, and because travellers (especially women) often find the medinas at night a little confronting. Please note that Morocco is a developing country and as such the infrastructure is not as reliable as you would expect at home. Expect quirky plumbing and the odd cold shower! In the desert we will spend a night at a nomad camp: Facilities at the camp are very basic. Travellers will sleep in multi-share tents (4 persons per tent). Mattresses and bedding are provided. For those travelling in the winter months (Nov- April), we recommend a sleeping bag for additional warmth. 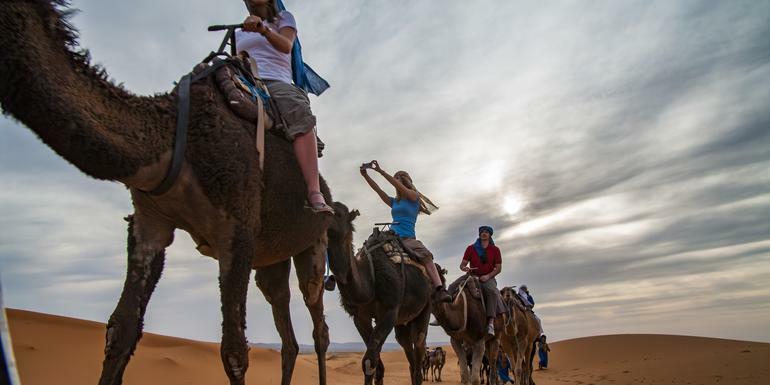 There will be the chance to take a shower after breakfast on our return to Merzouga the following morning. Breakfasts on tour Many breakfasts are included as part of your tour. Moroccan breakfasts tend to be different from your usual cereal and toast morning fare – most will be very simple - a croissant or sweet roll with jam and instant coffee and some hotels will have buffets where you will have more variety. While you are experiencing what a Moroccan family would eat, some travellers do find the provided breakfasts a bit “bread heavy” and enjoy buying fruit the day before to supplement their breakfast. Lunches and dinners Moroccan cuisine is world famous and your CEO will be taking the chance to show you the best of it. Staples include cous cous, a type of grain topped with stew, tagine which is actually the name of the pot this tasty dish is cooked in, and brochette, bbq skewers of meat. These meals will generally cost between 45- 70 MAD depending on the type of restaurant and which part of the country you are in. Other tastes not to be missed include pastilla, a sweet pasty with a savoury filling which is traditionally pigeon and harira, a delicious soup based on chick peas and filling enough when teamed with fresh bread to be a whole lunch. If you are heading to the coast the fresh seafood cooked at one of the local markets is a must eat! Snacks Morocco's fresh orange juice is highly recommended and you should not leave without trying a glass. The brave can try the tiny snails which are perhaps the local's favourite snack but you might prefer a cone of piping hot bite-size fried cake donuts. Generally meals are not included in the trip price when there is a choice of eating options, to give you the maximum flexibility in deciding where, what and with whom to eat. It also gives you more budgeting flexibility, though generally food is cheap. Our groups tend to eat together to enable you to taste a larger variety of dishes and enjoy each other's company. There is no obligation to do this though. Your CEO will be able to suggest favourite restaurants during your trip. The above information applies to G Adventures group trips. For Independent trips please check the itinerary for details of meals included. For all trips please refer to the meals included and budget information for included meals and meal budgets. Please note that there is a lot of fast paced travel on this itinerary which necessitates some long travel days in our mini van. We feel that if you enter this trip with this knowledge and expectation, you will appreciate even more the variety of locations we are able to include in this itinerary. We use a 16-seater minivan and with a full group every seat will be used. The legroom in the minivan is possibly smaller than you may be used to and taller passengers may find space a little cramped. It is important to be aware that as it is not a legal requirement in buses in Morocco, your vehicle may not be equipped with seat belts. The minivans have air conditioning, however please note that summer temperatures in Morocco can easily reach 50 celsius. When the outside temperature is so hot, a minibus air conditioning system will not be able to cool the bus to the temperatures you are used to enjoying at home. 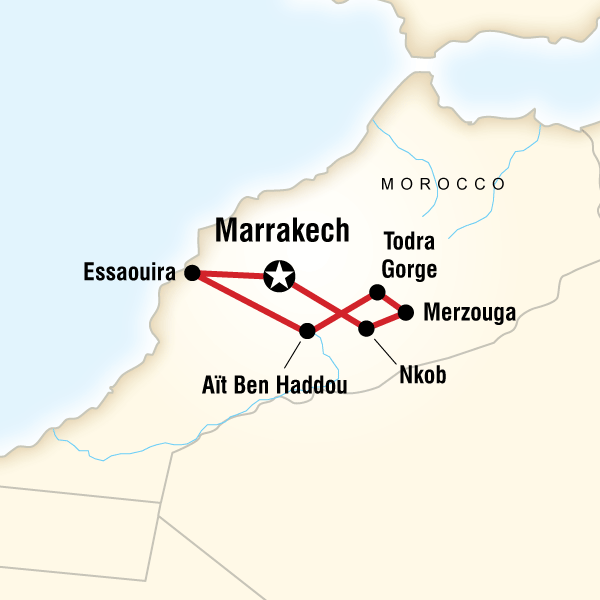 Please bear in mind that travelling in Morocco in summer will inevitably involve very hot temperatures and some discomfort may be experienced when travelling. This G Adventures group trip is accompanied by one of our group leaders, otherwise known as a Chief Experience Officer (CEO). As the group coordinator and manager, the aim of the CEO is to take the hassle out of your travels and to help you have the best trip possible. You can expect them to have a broad general knowledge of Morocco, including historical, cultural, religious and social aspects. They will also offer suggestions for things to do and to see, recommend great local eating venues and introduce you to our local friends. We also use certified local city guides where we think more specific knowledge will add to the enjoyment of the places we are visiting - we think it's the best of both worlds.